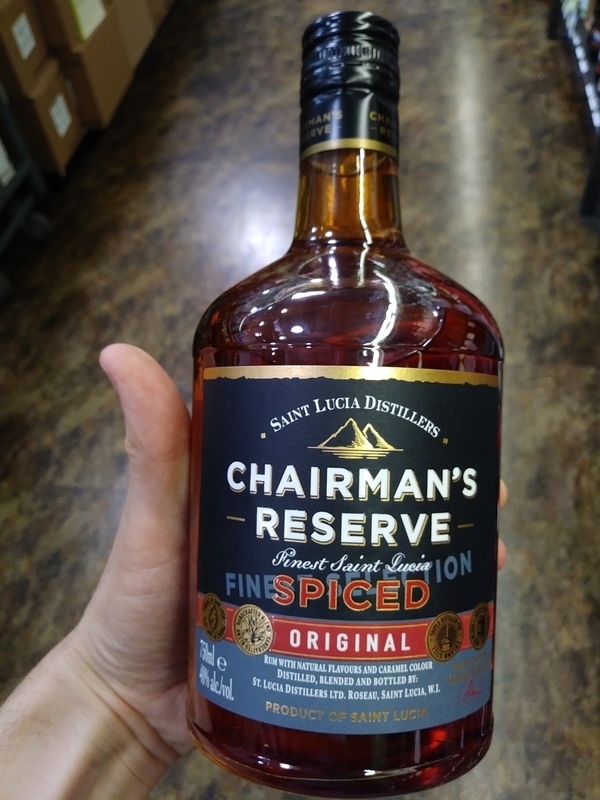 Have you found an online vendor selling Chairman's Reserve Spiced? This is truly a fine spiced rum, plenty of depth and complexity in flavour, thick and oily in the mouth, drink it straight, don't spoil it by mixing. This is a true spiced rum. A phenomenal smooth finish with just the right mix of vanilla, spice and nutmeg. I prefer this one ice cold on the rocks. Highly recommended! Still very enjoyable especially with a Saxbys ginger beer and a slice of lime..
Lovely copper / mahogany colour in the glass , first aroma is cloves which im not a fan of , followed by cinnamon , vanilla etc.. tastes fine sipped neat , just a bit sweet and syrupy. Better with ice and even better as a rum & ginger.. Doesn't compete with Rumbullion , Redleg , Untold or Cargo Cult imho.. not a re-buy but I will enjoy the rest of the bottle ! Has a strong banana and vaniila taste,a sweet and soft body and something like peach at the end.Very tasteful and appropriate if you want to drink the whole bottle. Just awesom rum! Awesome taste. Will buy it again one more time. Τελικά δηλώνω fan των ρουμιών που προέρχονται από St Lucia. Τουλάχιστον δε με έχουν απογοητεύσει μέχρι στιγμής. Σχεδόν πάντα ανώτερα των προσδοκιών και με μία ιδιαιτερότητα στην γεύση σε σχέση με όλες τις άλλες περιοχές. Ένα demi sweet rum που σέβεται αυτόν που θα το πιει , καθώς και τα λεφτά που θα δώσει. 8+ από εμένα . The fact that this is not your ordinary spiced rum is obvious right from the initial nose. which is a bit heavy on the banana but complimented by darker spices; cinnamon, cloves, possibly nutmeg. It pours a nice, dark amber and displays good legs in the glass. The mouth feel is good, the rum is smooth and the spices express themselves well while held in the mouth. Swallowing seems to intensify the flavours, leaving a very pleasing after taste with just the hint of an alcohol burning sensation. This is not your normal, sweet, offered at the bar spiced rum. The flavours are more subtle and subdued. Plus the rum is very smooth and the exact flavours leave you guessing. Would definitely work in some cocktails, however it is also just fine on its own. Taste 6+/10. If you like Spiced drinks go buy it, it has also some sweetness & maybe a very little dryness. Not bad drink, i can say funny in some way. En fortrinsvis billig rom, så man må ikke forvente for meget. Der er dog alt for meget appelsin i duft og smag. Den er helt gennemgående, så man fanger ikke så mange andre nuancer. Når man ser den flotte røde farve, tænker man om de har presset en blodappelsin. En snært af nelliker gør den meget juleagtigt. Had a rum tasting on a sunny afternoon, because why not. Chairman's Reserve Spiced Rum bottle and label design looks pretty nice. Pure alcohol and nasty artificial flavors to the nose and palate. Strong burn at the end. Mix it up for your own sanity. It seems that spiced rum's are booming at the moment and that also means a lot of spiced rum's are flooding the market. No surprise a lot have artificial flavors and a lot basicly taste the same. Fortunately this one stands out from the pack in a good way with it's own unique smell and taste. I really enjoy it with a coke, but don't overmix otherwise the balance is way of. A fine alternative to the usual vanilla style spiced runs. On the nose, lovely notes of cinnamon, cloves and citrus which all follow through on the pallatte too. Combination of spices really reminds me of Christmas. The dosage of cinnamon is killing the rest of the taste. Based on my experiences with spiced rums I was pleasantly surprised. In taste was cinnamon, clove, vanilla and muscat nut. Quite good. This Rum is the one that made me love Rum. Trully! Real rum, real fruit, real spice. Just add ice and you have nice old fashioned. I discovered St Lucian rums on our honeymoon...to St Lucia. We took a distillery tour and sampled all their rums. Well, I did and my bride drove! This is hands down my fav spiced rum, except for the rum I spice myself for tiki drinks!! Spices, spices and more spices. It has a superb aroma and is smooth to drink straight, no mixer, no ice. When delivered it did come with a bottle of ginger ale to try with it. This isnt my usual mixer but it did taste very nice and can recommend trying. This is a good one if you have no other choices and you MUST have a Dark & Stormy. I would have it for sipping unless i had a cigar in hand and no other choice of rums. It is pretty fruity on the nose, which made it quit appealing, but it feels like a head banger in the morning. Like I mixed it with coke (which I never do), and got a double shot of sweetness. So its just ok, not great. Really Heavy Burning Spice!!! Pirates only!!! If you like Heavy Spiced this is Ron right for you! I love rums that have heavy spiced aromat. This is really f*ckin heavy! Great single and with Cola/Pepsi accompaniament! Be aware! This is Huge Bomb!!!! Similar Rons: Ron The Jeremy XO, Kraken, Deadhead, Plantation Original Dark, A.H. Riise Black Barrel Spiced. With all of this Chairsman's Reserve is best!!! Dont f*uck and enjoy!!! Computer Pirates too! This is extremely Christmassy. You can taste and smell Christmas cake in it at every moment and for some time after you've drank it. Whether this is to an individual's taste would be highly variable. It depends what your tolerance is for heavy sweetness and the unusual. I'd say that it was good for a tipple over the Christmas period. Actually, if I'm honest, I'd sometimes prefer a really good sherry for that, but this is decent and a change. I'm giving it a 7 rather than a 6, because I think it deserves an extra point for making a bold and memorable statement. If you like the sweeter and spicier end of rums, I'd personally say that Dark Matter was better and more subtle as well as being more suitable away from the Festive Season - but this too is very much a debatable point according to subjective taste. Another similarly wintery one to this is Rumbullion - but that one is a little more subtle, less complex and has a spicey-orange flavour. "is infused with cinnamon, clove, nutmeg, vanilla"